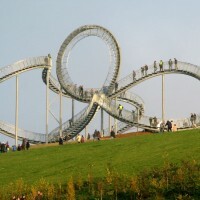 German artists Heike Mutter and Ulrich Genth have completed “Tiger & Turtle – Magic Mountain” in Duisburg, Germany. 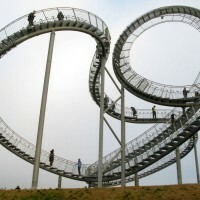 The curved flight of stairs inscribes like a signature on the landscape and recruits the nimbus of the classical roller coaster. Having a closer look, the public is disappointed in a disarming way. 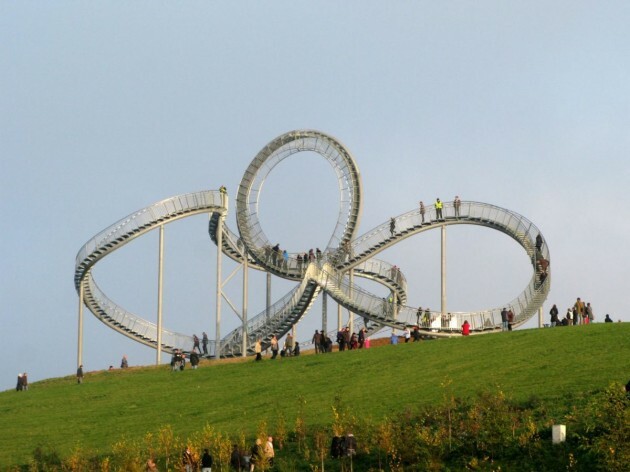 The visitor climbs on foot via differently steep steps the roller-coaster-sculpture. 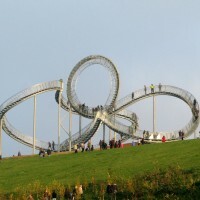 So the sculpture subtly and ironically plays with the dialectic of promise and disappointment, mobility and standstill. 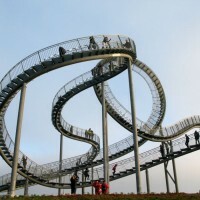 Visitors happen to briefly meet with oncoming visitors on the steep and about 1m | 1yd wide corridors. Led-lights are integrated in the handrails and highlight the flight of stairs so the sculpture is accessible at night, too. 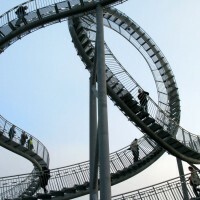 The magic mountain in the South of Duisburg happened to come into existence within only one year out of the blue and owes its presence to the shifting of large amounts of toxic zinc-slag that have accrued during the productions of local zinc works. 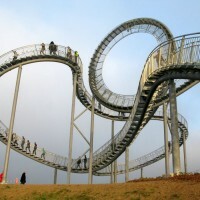 Visit Heike Mutter and Ulrich Genth’s website – here.